We are a leading Manufacturer of lanco type pvc threading machine and lathe type pvc pipe threading machine from Ludhiana, India. We introduce ourselves as one of the leading manufacturers of precision ad High Quality workshop machinery specialising in all type of Lathe and Pipe Threading Machines. We have lanched our new range of PVC Pipe threading to solve your threading problem quality wise and Production wise, we have the above special purpose lathes with capacity from 50mm. to 250mm for 3 mtr. Pipe and 4 mtr. Pipe. We provide quick change collet system for quick loading and unloading of pipes of varous sizes, with double saddle system for two operators working at a time for inside and outside threading simultaneously. The IMC Extra Heavy Duty Lathes are renowned throughout the World to give maximum efficiency and reliable performance under the most severe conditions of service with minimum maintenance cost. IMC Lathes are famous for precision jobs, accuracy and trouble free preformance. 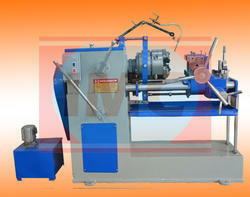 IMC Lathes have been designed to cater need of sustained accuracy and superb finishing. BED: The bed being the foundation of the lathes is carefully designed and is of high grade cast iron.It has cross-ribs to support its walls and three inverted 'VEES' assembled with removable gap for large swing. HEAD STOCK: The main spindle is of alloy steels with ground finish to give accurate results.The main spindle runs in bush or taper Roller Bearing. SADDLE: The V ways running on the bed and the slides are most accurately hand scrapped and aligned accurately with bed and the headstock.The saddle is fitted with 'Hand' and 'Automatic Travers' along the bed with steel rack and pinion.It is assembled with cross and upper slide graduated to give desired taper turning. TOOL-POST: The tool-post is made out of one piece steel block and can hold four different tools at a time and can be swivelled to any desired angle. APRON: The apron gives movement to the saddle for screw cutting sliding and surfacing by means of enclosed gears and half nut. All gears are of steel. TAILSTOCK: The tailstock is designed to give maximum strength bolt operation.It has long bearing within the barrel and ensures true alignment. THREE SPEED GEAR BOX: The three speed gear box is provided with the lathe to obtain coarse, midium and fine cutting ranges,both longitudinal and cross on the feed bar through gears.The lead screw with accurate thread is to be used only for thread cutting and can be engaged of disengaged with a handle provided on the gear box while the other handle is for obtaining the desired three speed. STANDARD ACCESSORIES: Supplied with the machine:- Face plate one-Catch Plate one-Centre two-Centre adopter one-Steady Rest one-Follow Rest one-One set of 23 gears-Threading dial one- Motor pully and Motor attachment.